Heat oven to 400°F. Spray 11x7-inch (2-quart) glass baking dish with cooking spray. In 12-inch nonstick skillet, heat 1 tablespoon of the oil over medium-high heat. Cook chicken, salt and pepper in oil 4 minutes, stirring occasionally (chicken will not be fully cooked). Remove with slotted spoon to bowl. In same skillet, heat 1 tablespoon of the oil over medium-high heat. 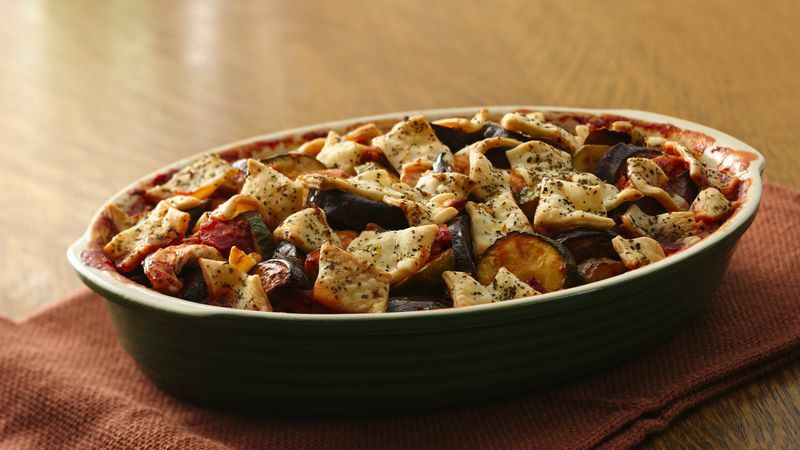 Cook eggplant, zucchini, onion, 1 teaspoon of the basil and 1 teaspoon of the oregano in oil 4 minutes, stirring occasionally. Add remaining 1 tablespoon oil. Cook 4 minutes longer, stirring occasionally, until vegetables are tender. Add garlic; cook and stir 1 minute. Stir in tomatoes and tomato sauce. Heat to boiling. Return chicken to skillet, discarding any juices in bowl. Remove from heat. Spoon into baking dish. Remove pie crust from pouch; unroll on work surface. Brush with butter; sprinkle with lemon peel and remaining 1/2 teaspoon basil and 1/2 teaspoon oregano, gently pressing into crust. Using pizza wheel or sharp knife, cut crust into various shaped (1x2-inch) pieces. Arrange pieces of crust over casserole, slightly overlapping edges if necessary. Bake 35 to 40 minutes or until chicken is no longer pink and crust is golden brown. Try using a Microplane® grater for the lemon peel. It produces superfine, delicate pieces.